by John Berry, Extension Educator, Lehigh Co. Agricultural marketing activities account for over 17% of the nation's gross national product. Additionally, roughly eighty cents of every consumer food dollar goes to cover marketing expenses. Clearly, performing some marketing chores are a possible source of increased revenue for food producers. However, when we take on the chores of marketing many challenges must be expected. Academics tell us marketing consists of product, promotions, placement, and pricing. One aspect of marketing that generates many questions is the function of pricing. 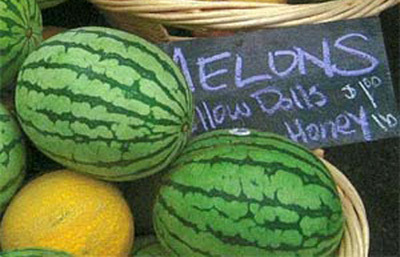 "What should I be pricing my melons at?" is heard on many visits to local farm markets. This leads me to suggest that prices and pricing must be a well thought through piece of your overall marketing plan. I firmly believe cost of production is the basis of calculating price. If our price does not at least cover our cost of production we are not even trying to break even. My mantra is "I can sit on the porch all day and be broke. I don't need to work and be broke." As an integral part of the marketing plan, price must be flexible enough to meet the competition and adjustable to changing situations. Having a clear idea of your marketing objectives and the target market for your products makes selection of a "proper price" easier. As we get comfortable with setting and adjusting our retail prices, we can start to consider if we are trying to maximize total profits, or the profit per unit. Are you willing to take a lower price if you could sell more units? The following table gives you a picture of this "game." The first row states that if your margin is 10% and you reduce your price 5%, it will take an increased sales volume of 100% to meet your planned revenue goals. Your cost for each product. Retail price needs to cover the cost of the good itself and ideally include a profit in addition. Possible sales response to price change. Many consumers are aware of the going market price. We do need to understand how our most significant buyers might respond to price adjustments. Costs and prices of the competition. If my cost of production and thus price, is higher than my real competition's selling price; why would customers buy from me? This is where we start to talk about "value" and not price. Probable responses from the competition to what you do. Many successful businesses pay attention to competition. How might the alternative sources of your products respond to your prices and any price adjustments? Proper pricing is essential to long-run business success, and pricing is as much a marketing concern as an accounting one. Additionally, pricing strategies can be a measure of management effectiveness. Ultimately, as we develop effective pricing strategies we harness the power of retail farm marketing. We are able to more easily reach our enterprises' marketing and financial goals.